Adolescent girls engage in a public event of which the consequences will be far-reaching. 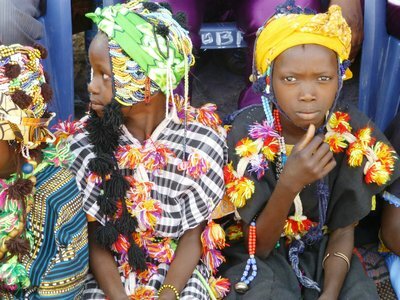 Instead of dressing-up as a prelude to subjection to Female Genital Cutting (FGC), these girls in Wassu, in the Gambia’s Central River Region in April 2013, are participating in a ceremony in which 30 circumcisers and 336 communities in the area pledged to renounce the practice. Several people, ranging from politicians, Islamic scholars, activists and academics gave speeches of solidarity and support, including me, as part of my ongoing work on gender justice in the Gambia and collaboration with Dr Isatou Touray, Founder and Executive Director of the NGO, GAMCOTRAP, which organised the event after years of campaigning and grassroots work in the locality. Sylvia Chant endeavoured, in picturing the faces of these young women, to capture the simultaneous joy, hope and solemnity of this occasion, considering the historical legacy of the practice for the health and human rights of generations before them.